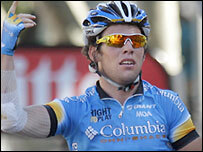 Mark Cavendish has pulled out of this year's Tour de France, his Columbia team has confirmed. The 23-year-old has been one of the stars of this year's Tour winning four sprint stages, a new record for a British rider. Following a tough two weeks riding the Isle of Man resident is suffering from fatigue and will now turn his attentions to next month's Olympics. Cavendish was victorious on stages five, eight, 12 and 13. The Manxman struggled to cope with three gruelling stages in the Pyrenees, but after his last victory on Friday he said he felt in good shape to continue and wanted to keep on winning. "It's a bit impossible to comprehend but now I'd see it as a failure to not carry on winning," he said after winning stage 13. "I only planned to do 10 days of the Giro but finished it and now I'm 13 days into the Tour not feeling too tired - I'll take every day as it comes and see how far I can get." Cavendish missed out on disputing a bunch sprint for the first time when, during Saturday's 14th stage, he dropped out of the main bunch on the small climb 10km from home. Although it's not a surprise to see Cav pull out, I think British cycling fans can't help but be mildly disappointed. That was won by points competition rival Oscar Freire, and Cavendish will now compete for Britain in track cycling's Madison event at the Olympic Games in Beijing. Cavendish, together with Bradley Wiggins, is the reigning Madison world champion.